You see, Granola is my life! Okay, that's a lie. Chocolate is my life. 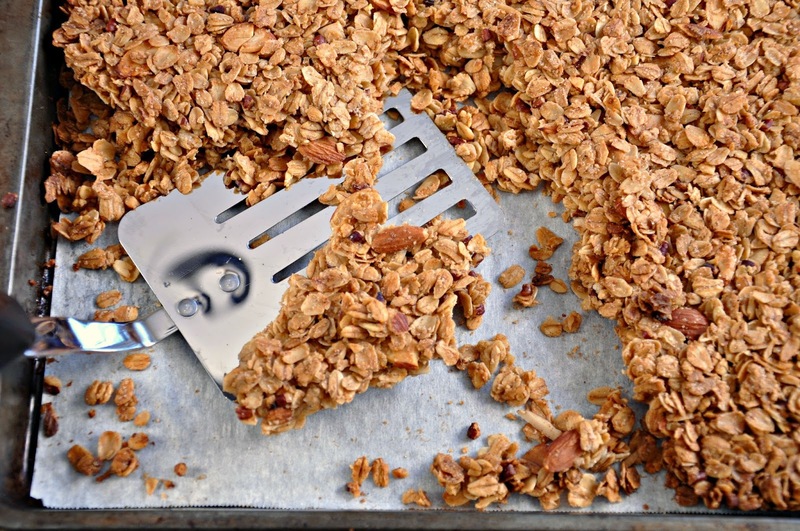 Granola is my sons' life. Granola...and protein bars. Instead of chocolate and cookies. Clearly,somewhere during their childhood, I failed as a sweet-eating, Valentine's-Day-candy-loving, mother. Sure, I know that there are a bunch of moms out there who would applaud the fact that I have two grown sons who prefer granola and protein bars to chocolate and cookies for Valentine's Day and I swear, this year I'm trying to embrace that fact. Honest, I am. This year, rather than spending time and money baking cookies that end up being eaten by other people's children, I'm making a healthy choice that I know my sons will love. It's not that I have a problem with other random adult children eating what I make, it's just that having them eat what I bake isn't really the point of me sending my sons Valentine's day treats. This is a recipe that I created based upon parts of several really good recipes that I found on the Internet and my own preferences. My version is more simple and straight forward. It doesn't have fancy ingredients. 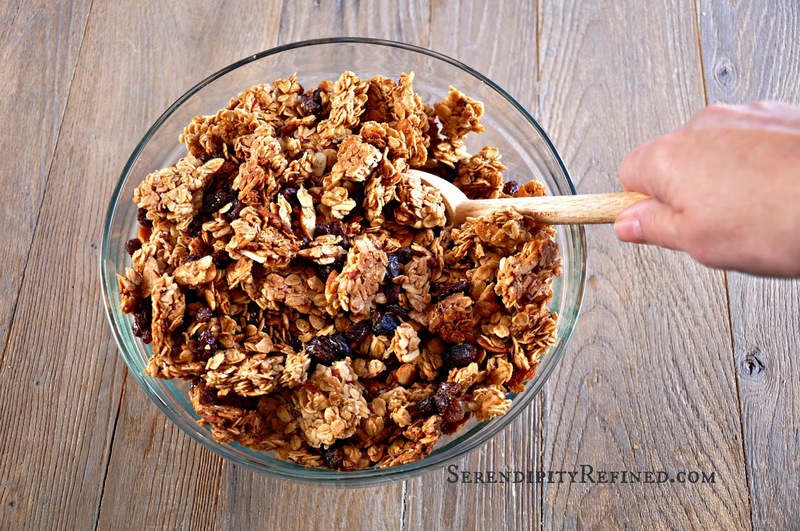 My biggest complaint about granola from the market is that it always tastes old and the pieces are small and powdery which means eating it as a snack is pretty much out of the question and using it as cereal with milk isn't much better because it turns into mush almost as soon as it gets wet. If there's fruit in it, the fruit is usually dry and leathery. 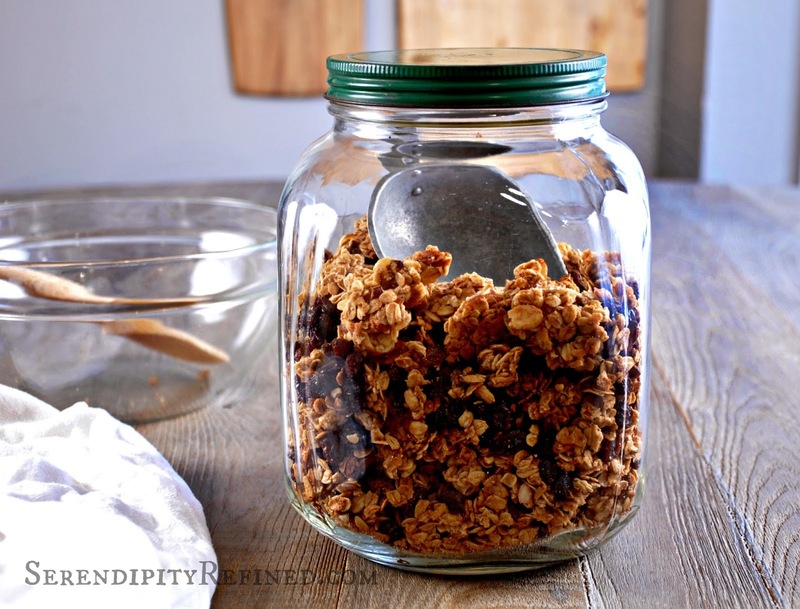 The other problem that I've had in the past is that with most granola recipes, you need to stir or turn the granola half way through baking. That may not be a problem for you but I always end up with half of it spilled on the inside of the oven where it creates a nasty smell as it burns or all over the counter or the floor where the dog would usually try to knock me down to get to it. This recipe solves all of those issues so let's get to it and I'll show you what I mean. Preheat oven to 325 degrees and line a rimmed baking sheet (12 x 17 inch) with parchment paper. 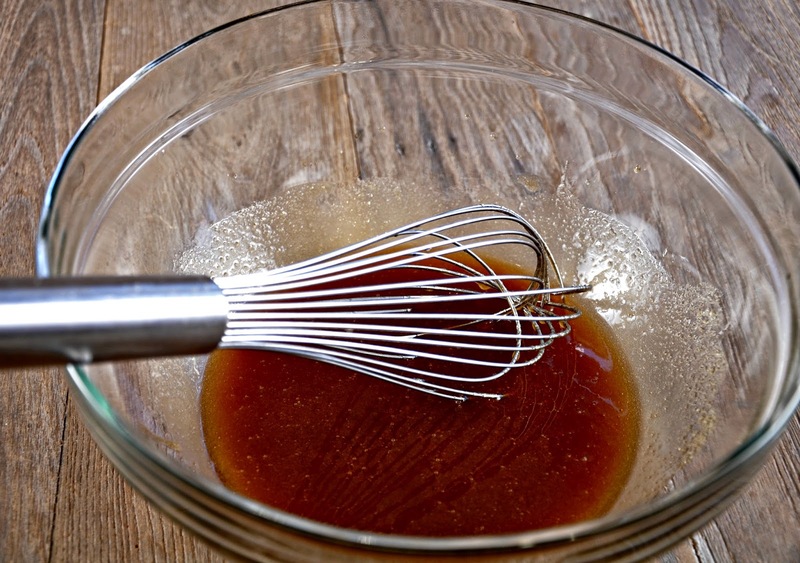 In a large bowl, whisk together maple syrup, brown sugars, vanilla, and salt until well combined. Whisk in vegetable oil. Note: Oil is our friend in this recipe. 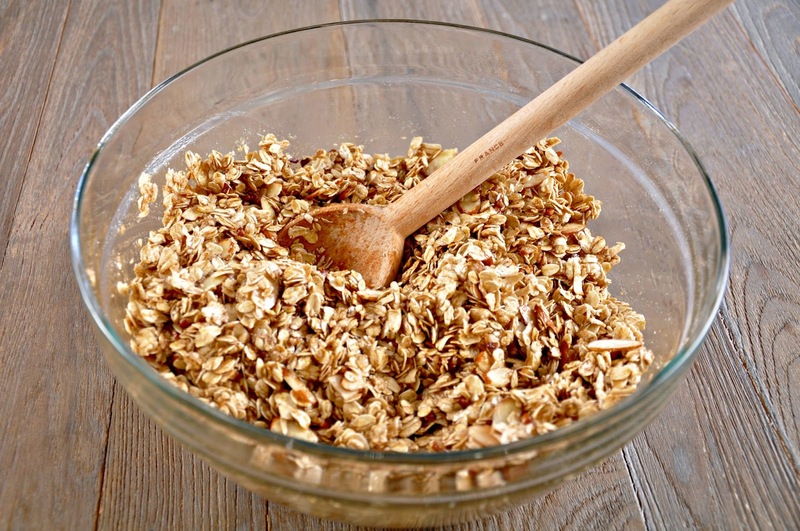 It keeps the oats from turning into dust when they're baked because as the water in the syrup evaporates, the oil helps to keep the mixture from drying out and turning to "dust". 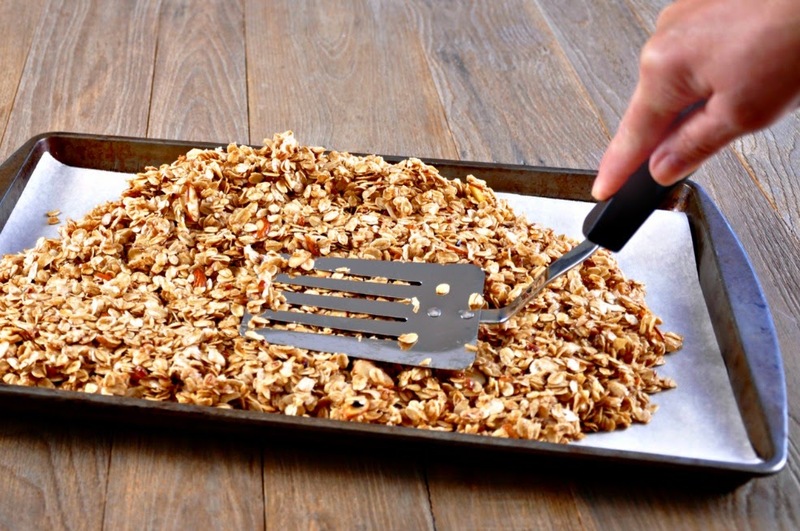 Add oats, almonds, pecans and cinnamon and stir until thoroughly coated. Turn the mixture out onto the lined baking sheet and using a flat spatula, firmly press the mixture into the pan to a uniform depth of about 3/8". Note: Press hard on the mixture in the pan.. The goal is to compress it into a "bar" that will be able to be broken into large pieces after they're cooled. 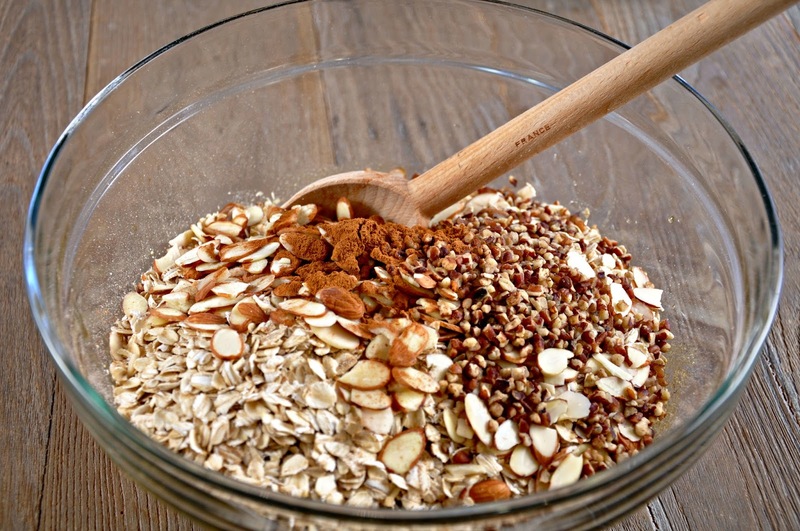 Also, DO NOT add the fruit until after the granola is baked and cooled. This keeps the fruit from being too dry. Bake for 40 to 45 minutes until lightly browned. Turn the pan once during the baking process. Remove the pan from the oven and place on a wire rack to cool for an hour. 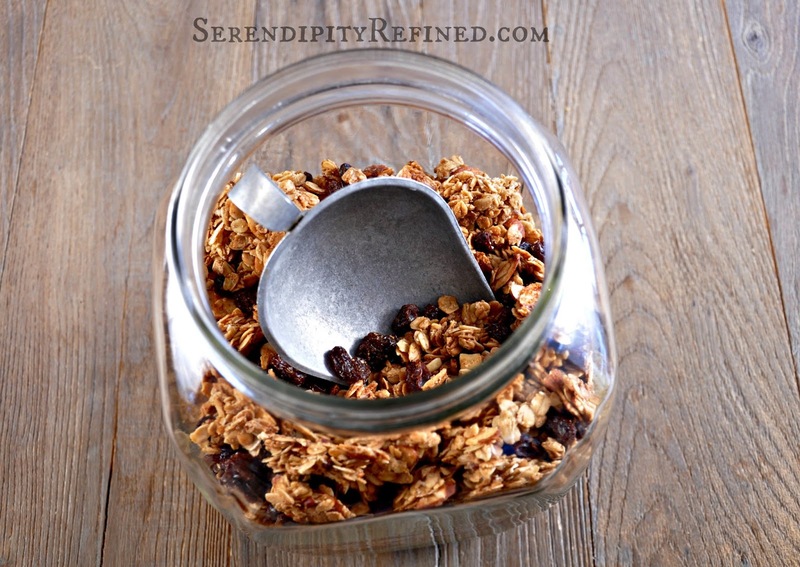 Using a spatula, break the granola into large chunks and place it into a mixing bowl. 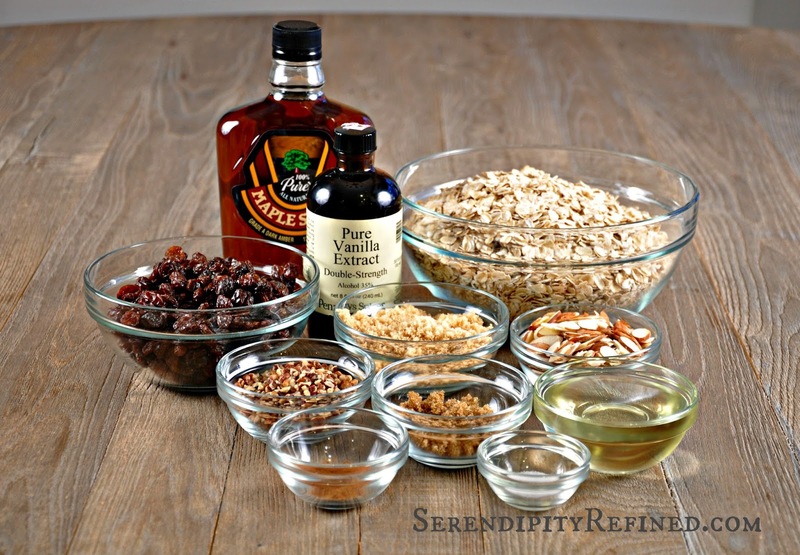 Add dried fruit and stir until combined. Store in an airtight container for up to two weeks (or as long as it takes for your family to find the container that you've hidden in the pantry). 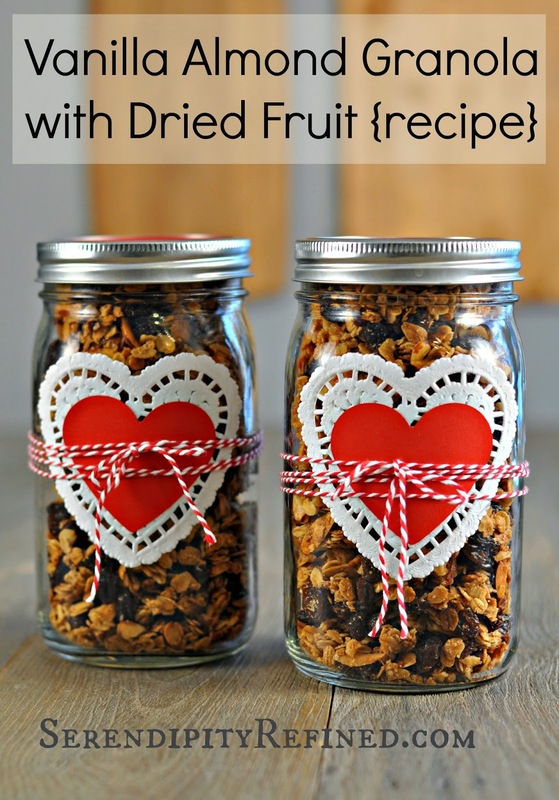 I was so exited about making this granola for my sons for Valentine's day that I told my youngest that I was baking something healthy for him this year instead of cookies. His response? "Is it protein bars?" and when I said, "no" the next question was, "Does it have peanut butter in it?" I suppose that I'm going to have to learn to make peanut butter protein bars after all. 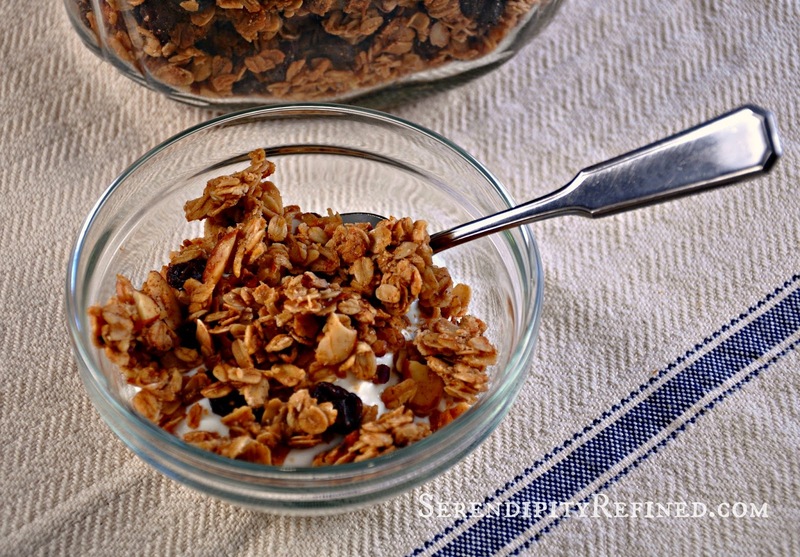 In the mean time, I hope that you'll enjoy this easy recipe for simple, straightforward, vanilla almond granola with dried fruit. It's great with Greek yogurt, wonderful for breakfast with milk, pretty darned good eaten by the handful as a snack. 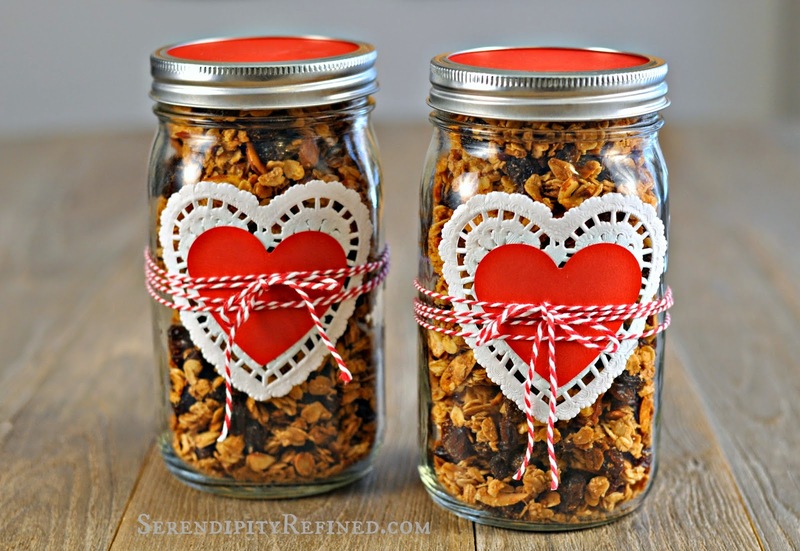 Make some for your health-conscious Valentine...and save a bowl for yourself!